We welcome all to join us for an observance of Maundy Thursday tomorrow at First Presbyterian Church. We will meet at 6:00 p.m. for dinner, followed by the Lord’s Supper, in the Fellowship Hall. After this (probably around 7:00), we will move into the sanctuary for a brief service of worship. The name “Maundy Thursday” comes from the Latin mandatum novum, referring to the “new commandment” Jesus taught his disciples (John 13:34). 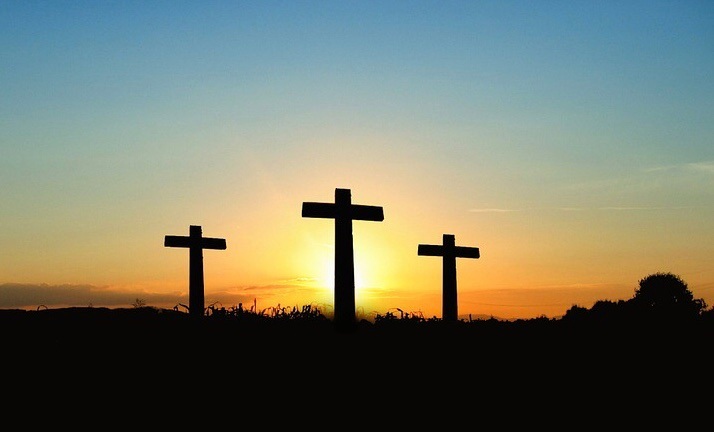 This is a sacred and a somber time, yet it is not a time without hope, for we know that out of the darkness of the tomb will shine the brilliant light of resurrection on Easter morning. and so share in the light of his Resurrection and Life. Through Christ our Lord, amen. Mission is at the heart of the gospel. Have you ever thought about that? When you become a Christian, you also become a missionary, because the God whom we follow is nothing less than a missionary God – always on the move, always leading people of every tribe, tongue, and nation into a deeper awareness of his reality and his claim on their lives. I saw this in action during our recent mission trip to Nicaragua. Six of us from Sylva traveled with friends from Arbor Dale and Newland Presbyterian Churches to spend the week with leaders of Young Life (AKA Viden Joven in Spanish). Vida Joven is a ministry to youth based in the United States but stretching all over the globe, and it was exciting to see it flourishing in Nicaragua. There are too many stories to recount from the trip, but one highlight was the night we attended a “club” meeting in Estelí. Club is Vida Joven’s weekly youth gathering, usually held in someone’s home, and this week we met at Daniel’s house along with 30 or so kids from the surrounding neighborhood. The night was warm and the sky was clear and the energy in the room was palpable. The kids danced, sang songs, and acted in a few skits before a young woman named Deanna came out to share a message from Luke 15, the story of the Prodigal Son. All of us, she said, have experienced getting lost. But God desires to find us and to bring us home. As Deanna spoke, I was so amazed at her courage and confidence. Here was someone who was still a teenager, growing up in the second-poorest country in the western hemisphere, with a fraction of the material resources that we normally rely on in the U.S., who was also participating so obediently in the mission of God. I was humbled and amazed and as the night wrapped up, I felt a deep conviction that we in America have much to learn from our Nicaraguan brothers and sisters about what faithfulness really looks like. There were other highlights too, of course. Before the club meeting, we spent all morning walking and praying through the neighborhood, which was a powerful experience of befriending and loving our neighbors in Estelí. The next day, we traveled up into the mountains to the La Finca camp to see where so many Vida Joven kids get to spend time with God and with each other. There we got to pick coffee beans, blaze trails for a new low-ropes course, walk a labyrinth in the dark, and eat loads of fresh fruit and gallo pinto (rice and beans) while sipping the best coffee in the world. Throughout these experiences we heard testimonies from the Vida Joven leadership, shared and received prayers, and dreamed about how the difficult but important work of discipleship can be shared back home in North Carolina. So often we think of mission work in terms of task-oriented service projects: the Peace Corps with a Christian twist. But mission work is so much wider and deeper than that. It’s a life of participating in the mission of God. And this life is always personal and particular and humble and open. In Nicaragua we met people with personal names like Deanna or Daniel; we visited particular places like Estelí and La Finca; we humbled ourselves to ask for help with Spanish and directions and toilet paper; and we opened ourselves to new experiences, to leaving our comfort zones, and to seeing God at work perhaps where we least expected him. To all of you who prayed or gave money to help us get to Nicaragua – thank you. I hope you’ll consider traveling with us in the future (because we do plan to go back!). And to all of us who have committed to the dusty road of discipleship, may we walk with a renewed commitment to the mission God has for us. Every year thousands of people die due to gun violence in the United States. While few of these deaths make headlines, each represents a life mourned by others, a life of unmet possibilities, a life of a beloved child of God. As a community of faith, it is right that we should gather to remember the sacredness of those lives and to reflect on the loss they mean to us all. 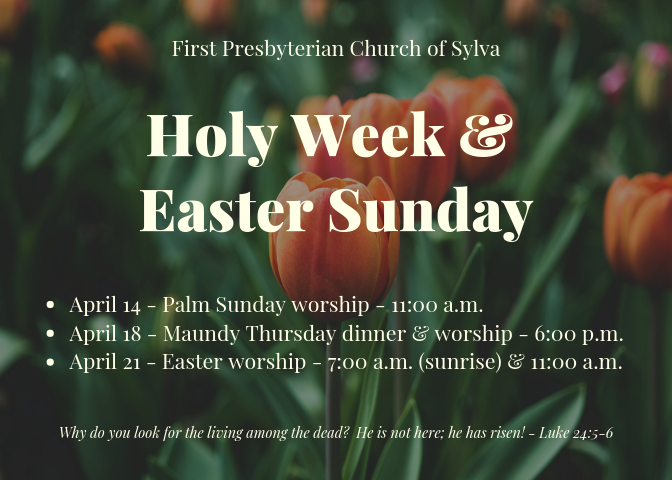 The downtown Sylva churches invite you to join us on Thursday, April 4 at 12:00 p.m. at the First Presbyterian Church of Sylva for a brief service of lament, prayer, and hope. Today is Ash Wednesday, which marks the beginning of the season of Lent. If you didn’t grow up with Lent (and I know many of you didn’t, myself included), here’s a bit of background. 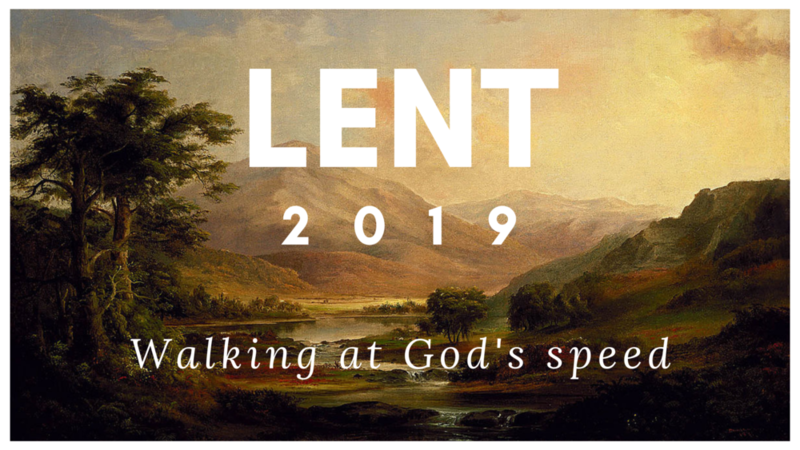 The word “Lent” comes from the Old English word for “springtime.” It refers to the length of time before Easter, traditionally forty days, when the Church prepares to commemorate Jesus’ crucifixion and resurrection. Just as Advent helps us prepare spiritually for Christmas, Lent helps us prepare spiritually for Holy Week and Easter. You may be asking, Do I have to observe Lent? The first answer is, Of course not. But the second answer is, Why wouldn’t you? This season is a gift to us in which we may pause and reflect on our lives in light of Jesus Christ. So, I encourage you to observe it this year. Typically folks use this time as a chance to give something up: certain foods, certain media, certain habits. In recent years it’s become popular to take something on: daily prayer, for instance, or journaling and letter-writing. Regardless, the goal isn’t self-promotion (pride) but self-effacement (humility). What will help you humble yourself over the next forty days, so that you can see Jesus more clearly? Whatever the answer is… do it. For a special focus during this Lenten season, several of us here at First Presbyterian Church are watching and discussing the short film Godspeed. Click here to watch the film, and then explore their website for additional resources. We finally have a couple sunny days and the guys are hard at work on our Cornerstone project at FPC. (Well, they never stopped working, but now they can work on the outside as well as the inside!) New developments include downstairs windows, hardiplank siding, electrical wiring, and HVAC conduits. Next we will see the insulation go up, followed by drywall and the rest of the siding. The church office will move into the main room of the Mary Jay Patten Center (which used to be a living room). From there, visitors can access other staff offices, including the new pastor’s office, during the week. The main section of the bottom floor will be designated youth space, with access to a kitchen, bathroom, and backyard. The upstairs will feature two new rooms, plus a bathroom. One room will be for Sunday School and other classroom use, while the other room will be for Session and committee meetings. An new elevator will ensure that everyone has access to these new facilities. Take a look at the pictures below, and visit www.sylvapres.org/cornerstone for more info and to give online! We are over a month into the construction phase of our Cornerstone Campaign building project. James and his crew continue to work hard on renovating and expanding the Mary Jay Patten Center. We now have a second floor! Once finished, this building will house all staff offices and serve as the administrative hub of the church. We will also have more meeting space for Sunday School and youth classes. Why is this project called the Cornerstone Campaign? Because Jesus is at the foundation. Ephesians 2:19-22 tells us that Jesus has built his church on the apostles and prophets of old, and that he himself is the cornerstone holding everything together. Grounded in him, the church can grow and flourish as a dwelling place for the Lord. And that’s how we imagine ourselves at First Presbyterian Church. Take a look a look at the pictures below, and learn more about the Cornerstone Campaign by clicking here. Construction has begun at First Presbyterian Church! A new bathroom was recently installed upstairs in the main building, which will benefit our children and balcony-users for years to come. In addition, work has started on the Mary Jay Patten Activity Center next door to build an addition and to create new office space. Due to this, all classes and programs that typically take place in the MJPC will be relocated to the main church building, and the MJPC will be closed. Check out the photos below, and read more about the Cornerstone Campaign by clicking here. Photos will be posted here on the church blog, so check back soon for more updates. Did you know we have two active adult Sunday School classes at First Presbyterian Church? Both class meet from 9:45-10:30am on Sunday mornings. We invite all to come and learn more about the Bible, the Christian faith, and the life of following Jesus! First Presbyterian Church will be hosting "Worship on the Longest Night: A Service of Wholeness & Healing" on Wednesday night, Dec. 19, at 6:00pm in the sanctuary. This is a simple, prayerful service for those who struggle during the holidays. Are are welcome to attend. December is here, which means Advent is upon us and Christmas is right around the corner. Notice how I phrased that – Advent is here, and Christmas is not here yet. Every year I need this reminder, don’t you? It seems like our culture pushes Christmas on us earlier and earlier, from We Wish You A Merry Christmas playing on the radio to Santa Claus showing up over Thanksgiving dinner. Call me a Scrooge, but I’m not ready yet. I don’t think we’re ready yet. I think the church knows what it’s doing when it sets aside four whole weeks to watch and wait for the coming of Baby Jesus in the manger at Bethlehem. This is certainly what the Bible encourages us to do – to watch and wait for the coming of the Lord. Indeed, the whole Old Testament can be read as a prologue to Jesus, setting the stage for Israel’s Messiah. Even the New Testament doesn’t begin with Jesus’ birth, but with expectation. Luke’s Gospel, which I’ll be preaching through all winter, starts with angel visits and John the Baptist and Mary and Joseph. The point is, Christmas is not here yet. We have to wait. I think this is what Henri Nouwen had in mind when he wrote those words: “Life is Advent. 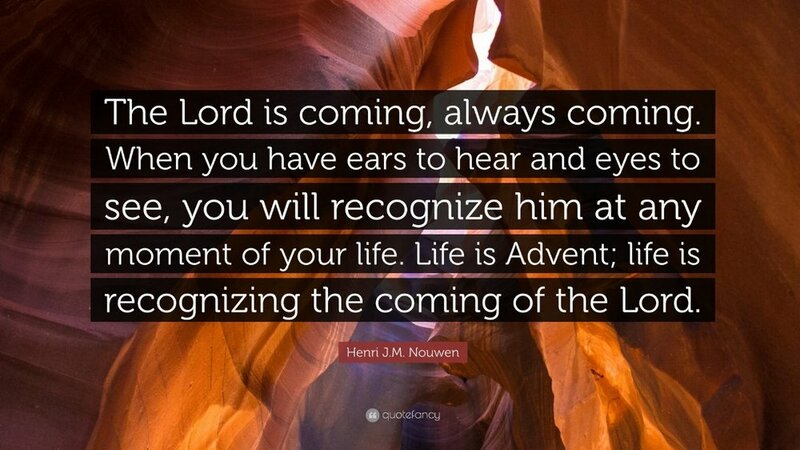 Life is recognizing the coming of the Lord.” Nouwen knew that to be a Christian is to wait upon the Lord. The Lord doesn’t wait on us; we wait on him, watching for his hand at work, listening for his still, small voice with patient yet eager expectation. I wait for the Lord, Psalm 130 tells us. My soul waits, and in his Word do I put my hope. I wonder: How do you wait for the coming of the Lord? With eagerness? Giddy anticipation? Impatience? Indifference? Waiting is hard, isn’t it? It’s one of the hardest things we must do, at any point in life. Whether you’re a child on Christmas Eve or an adult at the DMV, we all find ourselves chomping at the bit for what’s next. Why is that? I tend to think it’s because when we wait, we are not in control – and lack of control is a scary thing. Waiting forces us to be on someone else’s timetable, in someone else’s care, under someone else’s watch. This Advent, as we count down the days to the birthday of our Savior, and as we look forward to his coming again, I invite you to wait. As you do, trust that waiting time is not wasted time. For in the midst of waiting, we prepare. We prepare our homes through decorations, food, candles, and calendars; and we prepare our hearts through prayer, contemplation, worship, and fellowship. We wait and prepare, so that when the Lord Jesus arrives on Christmas, in his humility and in his glory, we will be ready. Radically and basically, all sin is simply ingratitude — man’s refusal of the one but necessary thing which is proper to and is required of him with whom God has graciously entered into covenant. As far as man is concerned there can be no question of anything but gratitude; but gratitude is the complement which man must necessarily fulfill. The Old Testament can be kind of a pain. It prompts debates about evolution. It’s full of obscure laws that we don’t even bother to follow, difficult-to-pronounce names, and hard-to-understand poetry. Yikes. I mean, sometimes it seems like the Old Testament is more trouble than it’s worth. Maybe it’s best to sort of just forget about it or gloss over it on our way to the important part of the Bible. You know—the good part. With Jesus. Is the OT really worth the effort it takes to read it? The more I’ve studied the Old Testament the more I’ve come to see how important it is for Christians to understand it and how tragic it is that the OT can be so neglected and underappreciated. So here’s my list of why I think we as Christians should become OT experts. 1. The OT reveals God’s patient and tenacious love. The OT unfolds over thousands of years. (The New Testament, by comparison, spans less than 100 years.) And in the OT we encounter people who are a lot like us: sinful, stubborn, prone to wander away from God and to make stupid choices. And yet we see a God who chooses to stick it out with this messed-up group of people. Reading through God’s interactions with his people in the OT helps me remember just how steadfast God’s love really is. 2. The OT helps deepen our faith. As Richard Dawkins points out, the picture of God in the OT can be troubling and confusing. But instead of running from the questions the OT raises for us, we have an opportunity to dive head-first into the questions. In fact, the OT is filled with examples of people who have plenty of their own questions to hurl at God: Job, Elijah, and Jeremiah, just a name a few! Dealing with the sticky issues helps our faith grow and mature, and it shows us that we’re in good company when we ask tricky questions. If God can handle the questions that came from those folks, God can handle our doubts and questions too. 3. The NT tells us to know the OT. Ever read 2 Timothy 3:16-17? “All Scripture is God-breathed and is useful for teaching, rebuking, correcting and training in righteousness, so that the servant of God may be thoroughly equipped for every good work.” Paul wrote that before any of the NT was Scripture—in other words, back when the only Scripture in town was the OT. So we can take these verses as a strong exhortation to get to know the OT. 4. It’s fun! Bears tearing young hoodlums to pieces? Family drama that could rival any soap opera? 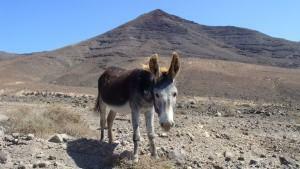 A talking donkey? All these stories and more are treasures to be found in the OT. 5. The more you understand the OT, the more you will understand Jesus. We often forget that Jesus was thoroughly Jewish. He was immersed in the world of the Hebrew Scriptures. In fact, it’s hard to overstate how much the OT shaped his life and mission. If we want to become like Jesus, we can’t get around the OT. Is the Old Testament sometimes tricky? Yes. Maybe even boring in spots? Yeah. But growing in our faith is worth the hard work of poring through the OT and discovering the riches it contains. 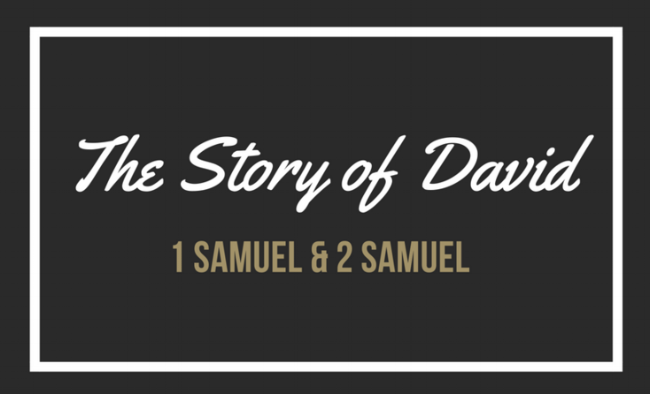 This Fall I will be preaching through the life of David, which you can read about in 1 Samuel and 2 Samuel. David might be a familiar to you as the shepherd who became a king; as the boy who slayed a giant; as the author of most of the Psalms. He wasn’t perfect — far from it — but he’s gone down in history as “a man after God’s own heart.” Most importantly, he helped set the stage for the coming of Christ. What can we learn from this man’s story? How can his life and witness shape our own stories, as followers of Jesus? Read about David and join us on Sunday mornings to find out! Last month I reflected on the topic of “mission.” I’d like to continue in that vein this month. Fall is a season when so many of us go back to school, back to work, back to routine – so it’s an important time to buckle down on what we’re called to do and why we’re called to do it. We’ve also just started a four-week study of our church’s mission statement, so I hope this topic is fresh on your minds already. Truthfully, there’s never a bad time to talk about mission, just like there’s never a bad time to check your compass to make sure you’re headed in the right direction. The mission of First Presbyterian Church is to make disciples who love Jesus Christ, love the church, and love their neighbors as themselves. That’s what we’re all about. This mission is rooted first and foremost in the good news of Jesus Christ, which is nurtured in the context of Christ’s body, the church, and which is expressed out in the world for which Christ died. As your pastor, my deepest hope is that you would believe in this mission, live it out, and teach others to do the same by the power of the Holy Spirit. 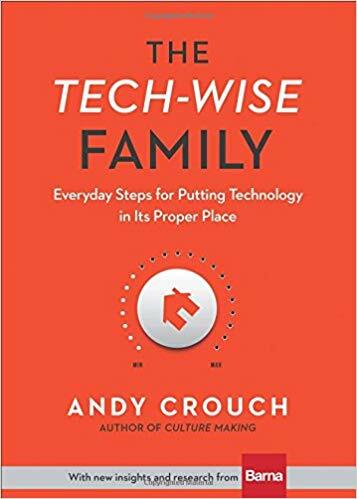 As a concrete invitation into this mission-centered way of life, I want to invite you to recommit yourself to our church family for this fall season. Maybe you have traveled a lot this summer and have been out of the swing of things; maybe you’ve been busy with work or hobbies or simply sleeping in on Sunday mornings; maybe you’ve been coming to worship but have been looking for other ways to serve and grow. Regardless of where you are, let this be the beginning of a new season of ministry for all of us. Come check out a Sunday School class. Enjoy food and fellowship at Family Night Supper. Join us on our campout at beautiful Smokemont in the Great Smoky Mountains National Park. Sign up to help the hospitality committee bring a meal to someone in need (and join the hospitality committee – or another committee – while you’re at it!). Give financially to support the “Cornerstone” campaign. And, of course, come to worship and lift your voice to the Lord. We need you and your gifts among us to fulfill this mission together, to the glory of God. If you had to write a mission statement for your life, what would it say? I’ve been reflecting on these questions recently for two reasons. First, the latest Mission: Impossible movie came out in theaters last month, and I’m eager to see it. (Tom Cruise is a wild man!) Second – and more importantly – I’ve recently returned from a continuing education trip that focused on this very topic: mission and the church. During my time away, I met with seven other pastors to read through the work of the 20th century missionary Lesslie Newbigin. Newbigin was adamant throughout his ministry that mission is not tangential to the gospel, but at the very heart of the gospel. Jesus, after all, came on a mission to rescue us, and Jesus has commissioned us to make disciples in his name. The church, therefore, doesn’t have a mission; the church is a mission – a “joyful participation in Christ’s ongoing life and work,” as our Presbyterian Book of Order says. So if you’re wondering what your personal mission in life is, look to the Lord. Look to Jesus. He already has a mission statement for you, and he invites you to share in that mission with other people in a community called “church,” for the life of the world. Starting at the end of August, I will preach four sermons on the topic of mission, focusing specifically on our mission statement at First Presbyterian Church: “To make disciples who love Jesus Christ, love the church, and love their neighbors as themselves.” This statement has its roots in Jesus’ conversation with a teacher of the law in Luke 10. We will study Scripture and break the statement down week-by-week to consider how God is leading us on mission together in Sylva and beyond. I hope you’ll join us. Whence all these gifts and graces still arise. And calls us to become the song he plays.